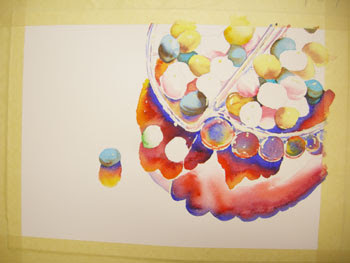 Using the same technique as yesterday, I am painting the shadows for the "Yellow" candies. Because I don't want the candies to turn strange colors, I am glazing the yellow candy shadows with a bit of Burnt Sienna. I am again trying to pay attention to the crisp and soft edges, wetting the edges where I don't want crisp lines. If you would like a more dramatic effect, use a mixture of French Ultramarine Blue and Permanent Alizarin Crimson, very wet, to make a light purple color for the shadows of the yellow candies. Allow these painted shadow areas to dry. After the shadows are dry, apply a nice, bright, wet glaze of Aureolin Yellow. Cover the shadow areas and the entire yellow candy. If you like, you can drop in a little New Gamboge here and there with a wet-in-wet technique.